The Late Acheulean hand axe, going back about 500,000 years, "is the oldest technology that pretty much everyone agrees is unique to humans," says experimental archeologist Dietrich Stout. Are you between the ages of 18 to 50, right-handed, and available for six hours per week? 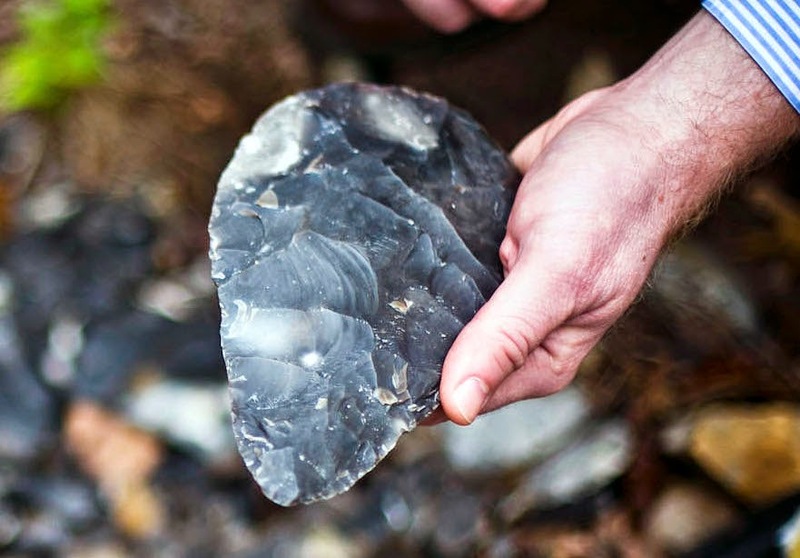 Emory experimental archeologists are looking for at least 20 healthy individuals willing to devote 100 hours over about four months to learn the art of making a Stone Age hand axe. “We need novices who will really commit to learning this prehistoric craft,” says Dietrich Stout, an assistant professor of anthropology and head of the Paleolithic Technology Laboratory. Nada Khreisheh will train participants. 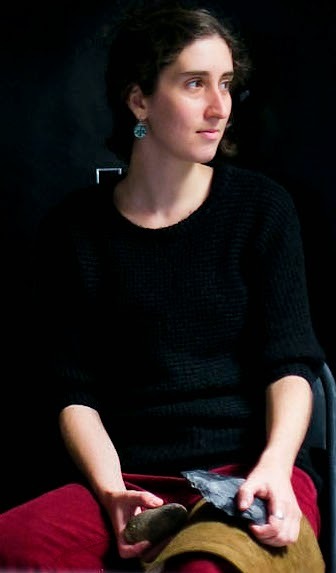 Nada Khreisheh, a post-doctoral researcher in the lab, will train the participants to break and shape flint, a skill known as knapping, as part of a major, three-year archeology experiment to investigate the role of stone tools in human brain evolution, especially key areas of the brain related to language. For more details on how to apply, send her an email: nada.n.khreisheh@emory.edu. In addition to attending tool-making training sessions, participants will undergo three magnetic resonance imaging (MRI) scans and eye-tracking experiments. And they will need to provide brief written feedback about their experiences following training sessions. The ideal candidates to join the experiment would likely be curious about who we are as humans and where we came from. “If you’re not interested in trying to answer those questions, it might be hard to justify all the time and effort that will be involved,” Stout says. 1. You will be making history. Earlier studies, by Stout and others, have compared the brains of experienced knappers with novices. The results have all suggested that the part of the brain engaged in making a hand axe overlaps with areas associated with language. Longitudinal data, following people as they learn to master the art of making a hand axe, should provide a more definitive result, one way or the other. “This is a much more focused and rigorous test than any previous study,” Stout says. 2. You will be making prehistory. The hand axe represents a pivotal point in prehistory and an ideal technology to hone in on key ways that we shifted from more ape-like hominids into full-fledged humans, Stout says. Simple Oldowan stone flakes are the earliest known tools, dating back 2.6 million years, before the human family emerged. The Late Acheulean hand axe, going back 500,000 years, embodies a much higher level of refinement and standardization. The stone tool experiment has its own logo, designed by Khreisheh. 3. You can get in touch with your Acheulean roots. 4. It is an interesting challenge. “Many people expect it to be easy, because it’s ancient technology,” Stout says, but it’s actually challenging to chip out the lens-shaped cross-section of the hand axe, and thin down its edges to expert sharpness. “A lot of self-control is involved in flint knapping. You have to not get frustrated and just start banging on the rock,” he says. 5. It’s fun, once you get the hang of it. 6. It may give you an edge. Dietrich Stout surveys his stash of flint stones near the Anthropology building. 7. You will never have to knap alone. If you decide to turn it an ongoing hobby, you can tap into an established community of knappers. They have conferences, publications and even exhibitions of lithic art. “Some of the better pieces are like sculpture,” Stout says. 8. It will change the way you look at rocks. 9. Stone tools have practical uses. You could not ask for a more impressive paperweight than a hand axe that you made yourself. “I grab one of these things when I want to open a box,” says Stout, waving at the array of stone flakes spread out in his lab. “One of my advisors made a lemon squeezer out of blade cores,” Khreisheh adds. Another dedicated archeologist actually elected to have major surgery done with obsidian blades, rather than steel scalpels, to demonstrate to his students that stone tools are more technologically advanced than many people realize. 10. Understanding neural systems may lead to broader applications. “Any insights into how people understand physical activity and language may lead to new ways to help people with brain damage or language difficulties,” Stout says. 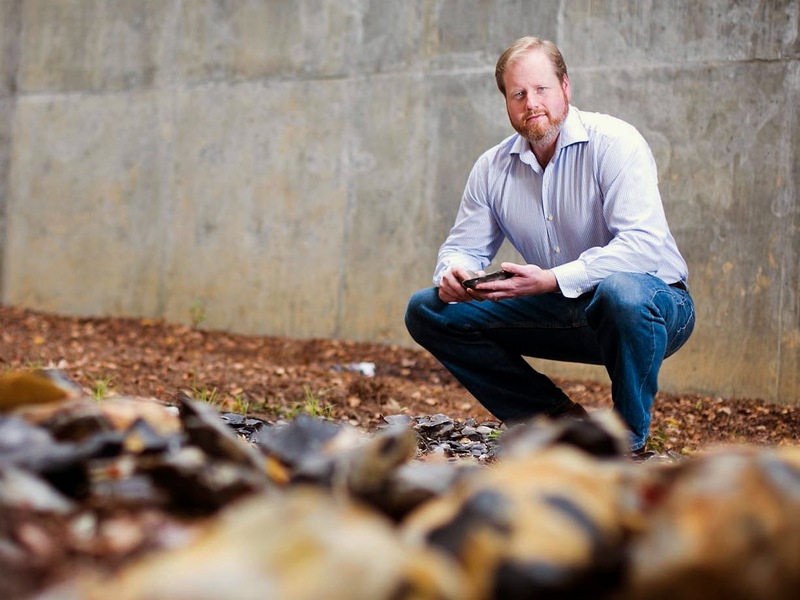 He hopes the tool-making experiment will benefit a range of neuroscience research. The project is funded by the National Science Foundation and the John Templeton Foundation, through a program designed to integrate science across disciplines. All photos by Bryan Meltz, Emory Photo/Video. In Atlanta, on the Emory campus. I'd be well up for this but I suspect I live too far away since I live in Lampeter, West Wales. so...no people who already have knapping experience? Sorry, the cut off is age 50.
more discrimination from the"right mans world"
Okay, for all the lefties, here is an explanation from Dietrich Stout for why you are excluded: "For us the problem is that right- and left-handers may have different brain organization (e.g. which side things are represented on) for both manual skills and language. It would be very interesting to investigate this further, but since we still have only a small sample (20 people) to work with we need to eliminate as many variables as possible. We chose to work with right-handers rather than left-handers because righties are more common (now and in the past) and because they are a somewhat more uniform group. Apparently there are more different ways to be left handed than right handed." When is this and how do I apply/sign up? 21 year old anthropology major. No experience with knapping. This research is ongoing at the Emory campus in Atlanta. Read the first three paragraphs of the story, an email contact is at the end of the third paragraph, if you are in Atlanta and meet criteria. I'd love to participate, but I'm in Connecticut. If you have affiliations at Yale or UCONN, let me know. Sorry, it's limited to the Emory campus.